SIGN ME UP IN Sports Interaction!Sign Me Up! Canadian as they come – SportsInteraction was born and raised in the Great White North. Serving Canuck sports wagering fans since 1997, this online wagering legend is licensed by the Kahnawake Gaming Commission in Canada and the Jersey Commission in the United Kingdom. Offering sports, casino, poker and horse betting action - SIA is a one-stop top gambling hotspot 24/7 every day. CLAIM YOUR BONUS - Interact with Canada’s favorite online sportsbook! Join today to collect a 100% bonus that pays up to $200 in extra betting cash! SportsInteraction has been a major player on the online sports wagering scene for over two decades now. Joining the mad-rush to gain an internet presence way back in 1997, when bookmakers were popping up like mushrooms, this Canada focused sports betting pioneer has withstood the test of time. Secure and simple is the SIA way as they protect their clients with top rated security measures and the website is very easy to navigate. SIA also offers a nice mix of popular banking options and their “one-wallet” account system allows bettors instant access to each of the exciting platforms. 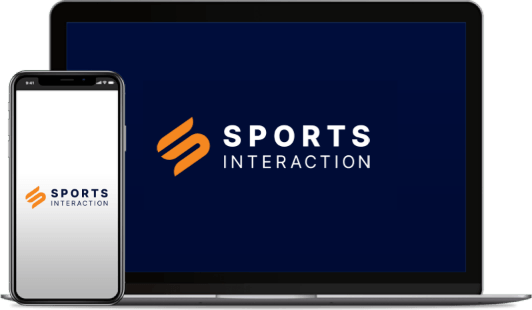 Simple to understand, and easy to cash in on, the SportsInteraction promotions package gets straight to the point. New clients can collect a 100% sign up bonus that returns up to $200 in cold hard cash. Following a simple registration process, that is quick and secure, SIA matches initial deposits of $20 or more dollar-for-dollar. The deposit and bonus money is available immediately and this promo has a 10X rollover rate. Accepting the first deposit bonus is optional and players are advised to view the Terms and Conditions at the website. Beyond the sportsbook signup bonus, SIA offers unique promos and contests across their various wagering platforms. Casino players can collect up to $100 in free plays with the 100% Welcome Reward and they are eligible for a monthly reload bonus. Card players, who make an initial $20 deposit in the poker room, receive free game tickets and up to $200 in free plays. Pony betting fans have access to a world-class racebook and bonuses collected in the sportsbook can be used to wager on exciting LIVE horse racing action. Professionals, in every sense of the word, SportsInteraction really shines with their “sports first” focus. From North American Big Four leagues, to a vast array on International events, the sportsbook acts as the SIA homepage. Most Popular, LIVE Now and Last Minute Bets sections load down the middle of the page and over 20 sports are conveniently clickable in a sidebar. Clean and intuitive, the title bar has instant links to the Casino, Racebook and Poker Room, as well as links to the fast-paced LIVE casino and sports betting platforms. Well respected, as early pioneers in the online gambling industry, it stands to reason that SportsInteraction would be a leader when it comes LIVE betting. Growing in popularity and functionality, the excitement of in-game wagering makes even the most lopsided matches a one score contest. MLB action is a classic example as a team down 7-2 in the sixth inning will usually receive 4.5 runs on the SIA LIVE betting board. With that spread price, bettors are a single run, plus some lock-down defense, away from cashing in a winning ticket. Grounded Vinaloop. Fans of South Park will recognize that as the “Hello, Customer Service, This is Steve” episode that largely reflects the state of client care today. Although it’s funny, it’s also sadly true in many regards. We are however pleased to report that customer service has survived and it’s thriving at the wagering sites we recommend here at Canada Sports Betting. SportsInteraction makes that grade as they have a fantastic LIVE Chat feature that makes their Toll Free Phone and Email customer support departments a near non-necessity. Getting to the meat and potatoes - SportsInteraction betting odds are some of the best on the internet. Posted in a timely fashion, especially on NFL and NHL action, the prices are competitive and the coverage is extensive. From Aussie Rules Football to Volleyball, with a ton of additional competitions in between, SIA was born and raised with a "sports first" focus. Though fairly middle of the road, SIA bookmakers tend to give a little extra value to their underdog lines. Remember, buying the best odds is a handicapping Golden Rule. Banking is a very personal and private matter and the mantra should always be “safety first’ when performing online transactions of any kind. Employing VeriSign Secure Socket Layer (SSL) protection, financial transactions at SIA offer the same security one would receive when purchasing NBA game day tickets or making any online purchase. The SIA banking section offers many popular account funding and cash out options – including major credit cards and wire transfers. Please visit the Cashier Section for pertinent details. Seldom is there a replacement for experience. SIA always has a solid read on the pulse of the offshore betting industry and they have a sharp eye for the latest technology. The Mobile betting platform is a solid example and they have an entire section dedicated to helping bettors stay connected on the fly. With laptops, tablets and smart phones, bettors can take SIA with them when they are out and about. Everything that's accessible from a desktop, including LIVE betting, is available at the m.sportsinteraction.com mobile site. Here at Canada Sports Betting, we respect handicappers and bookmakers equally. We want Canuck 'Cappers to get the best bang for the betting buck and we only recommend sportsbooks that meet our strict criteria outlined above. Looking out for both sides, we are proud to offer solid alternatives to the Provincial Sports Lottery schemes. With age comes perfection and, though it is virtually unobtainable, SportsInteraction is always working toward being the best in the gaming business. They have lots of competition, as illustrated in our Top Bookmaker list, but we have watched SIA grow for many years now and they are always on the cutting edge. We remember a time when we gave them negative points due to the lack of a LIVE betting platform. As technology improved - SIA adopted it and they are now a top in-game wagering provider. Remember, the take it or leave it player rewards offer value to Bonus Hunters but can be passed on by bettors who prefer to bet with their personal stash. Overall, SportsInteraction continues to shine as a top rated online sportsbook. Want access to this bonus? Simply visit Sports Interaction via the link below, register a personal account, and make a first deposit. Click here to visit SportsInteraction.com! SIGN UP NOW!SIGN ME UP IN Sports Interaction! Score your free $200 bonus now! Start betting with our exclusive $200 signup bonus from the best sportsbook ranked.